Animal abuse is illegal in the USA but testing on animals is not. There are over 200,000 thousand rabbits, mice, guinea pigs, and hamsters being tested on until they are killed by the same companies (“About Cosmetics”). The animals used for cosmetic testing are also used for excruciating procedures such as being burned, forced to eat chemicals, and forced into surgeries. This is not where the abuse stops, the animals are also forced to live in tiny cages with barely enough room to turn around, a PETA writer explained their living conditions as “deprived of nearly everything that makes life worth living” (Goodman). The US doesn’t consider testing on animals animal abuse despite the torture to the animals. Animal abuse is illegal in the USA but testing on animals is not. There are over 200,000 thousand rabbits, mice, guinea pigs, and hamsters being tested on until they are killed by the same companies on a daily basis. Testing on cosmetics has also been shown as ineffective, and often useless. There are cheaper, quicker, more humane ways to test cosmetics and make sure they are safe for human use. 3D printing is a great example of this, recent studies have shown that scientists can 3D print organs and skin cells to test cosmetics on, although you can’t get the full effect from this it has proven to be more effective than testing on animals. Goodman, Justin. “Animal Experiments Are Morally ‘Unthinkable’.” People for the Ethical Treatment of Animals. 03 Apr. 2015: n.p. SIRS Issues Researcher. Wed. 31 Jun. 2017. 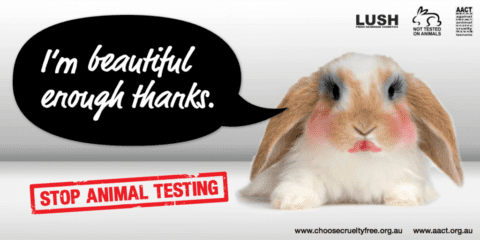 Discussion on Cosmetic Testing by Hadley is licensed under a Creative Commons Attribution-ShareAlike 4.0 International License.